Since its inception, Pinterest has matured from a social sapling into a marketing force for brands. But while Pinterest’s features have evolved dramatically over the years, morphing into a platform driven by search, the company’s vision hasn’t. At its core, Pinterest was designed to help consumers pinpoint products, passions and ideas, whether planning for a low-key family dinner, a new house, a wedding, a camping trip or a tricked out car. With each iteration of the platform, Pinterest has made it easier for consumers to bring their passions to life, beginning with Rich Pins, Guided Search, gender filters and now Buyable Pins. And how you can tap into Pinterest’s newest tool. What Is The Value Of Buyable Pins? To answer this question, let’s think about this through the eyes of a pinner. Scene. You’re planning to run your very first marathon, and, other than advice from overzealous co-workers, you have no idea where to begin. What to wear? How to fuel? What in the heck is this foam roller everyone keeps gabbing about? So, you start a Pinterest board. You call it, “My First Marathon! !” And you begin to explore Pinterest for products and training ideas that will get you, in one piece, across the finish line. Along the way, you even discover what a foam roller is, thanks to Teen Vogue’s instructional “Foam Rolling Made Easy” pin. As marathon day approaches, you continue to find cool new things (“They make special socks just for runners?”) and you add these discoveries to your board. This deep level of involvement in the planning process doesn’t just render Pinterest a likely part of the customer journey today; it makes it an influential one. According to a study produced by Pinterest and Millward Brown Digital, during a six-month period, 93% of active U.S. pinners utilized the site to plan for a purchase. Moreover, 87% had been influenced to buy something based on this engagement. Pinterest’s purchase influence becomes even more evident when you account for where the bulk of Pinterest engagement occurs. At the end of last year, we learned that the lion’s share of Pinterest engagement—75%—is mobile. By making it easier to purchase products discovered on mobile devices, Buyable Pins can help to streamline mobile shopping and to shorten the distance between mobile discovery and sales. 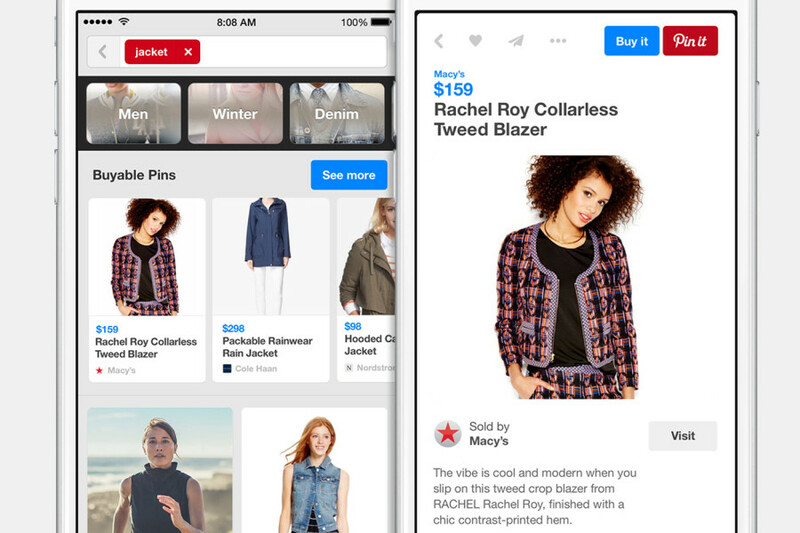 As Buyable Pins roll out across Pinterest, here’s what you’ll want to keep in mind. Below, you’ll find a few facts around what these pins look like, what features they offer, and where you can go to get started. 1. YOU’RE MY BOY, BLUE! Look for the blue price tag. This indicates that the product within the pin is available for purchase on Pinterest. Much like on a retailer’s website, pinners will be able to narrow their search based on budget. Our aforementioned marathoner, for example, could search for running shorts that are, say, less than $50. This makes it easier to find relevant products. When a pinner finds something they want to purchase, they can simply tap “Buy It” to get started with the checkout process. Purchases can be made with Apple Pay or a credit card. “We’re working with Apple Pay and experienced payment processors to make sure all credit card info is secure,” Pinterest has said about shopper safety. Buy buttons will initially be made available through ecommerce platform providers (this currently includes Shopify and Demandware), but larger brands such as Macy’s and Neiman Marcus have also forged direct partnerships. If you’re interested in signing up for notifications about future integrations, join Pinterest’s waiting list. At Curalate, we’ve been excited about the prospect of Buyable Pins for some time now. Why? It comes down to a trend that we believe strongly in. For brands, the point of purchase is increasingly moving closer to the point of interaction. As a result, it’s more important than ever for marketers to ensure that their content is optimized for commerce. If Pinterest is now a place where consumers can purchase products without leaving the Pinterest environment, then you need to be even savvier about your platform presence, including what products you share and how you present them. 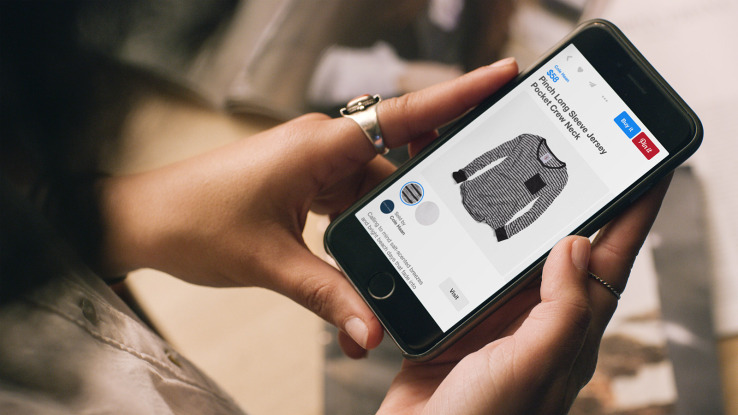 Below, you’ll find five tips for adapting your Pinterest strategy to Buyable Pins. First and foremost, your products need to be on Pinterest for consumers to discover them. This can be as tedious as it is obvious; brands add and remove items from their lines seasonally, monthly, weekly – even daily. Your Pinterest presence needs to reflect this, but how to do so in an automated fashion? The good news: Curalate recently developed a solution to help marketers overcome this hurdle. Called Index, Curalate can now programmatically get your products onto Pinterest – without spamming your followers or cluttering your boards. This makes it easier for consumers to discover your products and content, which is an important step if you’re looking to turn Pinterest into a driver of awareness, engagement, and sales. Brands are no longer limited to the stock images their creative teams provide. Today, marketers are able to choose from a variety of image styles – including stock photography, editorial photography, partner images, blogger and influencer-generated photos, and even those that their customers share. The quality of the image is key, but relevance is essential too. If your customers are more likely to interact with a photo of running sneakers on a person vs. atop a white backdrop, for example, opt for the former. If Pinterest has proven to be a viable platform for UGC (user-generated content), consider locking in on that piece of the puzzle too. Building off of the idea above, one of the most powerful parts of Pinterest is the data it yields. When a consumer takes the time to pin a product while shopping on your website, they’re signaling desire and intent. Harness this information. By analyzing which of your products and images are generating the most Pinterest engagement, you can better understand which of your creative assets are most likely to drive action. Use this information to optimize your Buyable Pin strategy. Pinterest may be driven by images, but your captions are what give the products within your pins context, weighing heavily on whether a user takes action on your content. With Buyable Pins, this becomes even more important. Package your pins so they speak to how consumers are using (or imagine that they could use) the products within them. You have up to 500 characters to share details, but succinct copy can go a long way too. One way to frame your pins so that they speak to the broader needs of your target audience: Make sure that your captions are rich in keywords. For example, if you’re an athletic wear brand vying for the attention of marathoners, seek out key terms that provide inspiration. Maybe that’s specifically using the term “marathon” or a related keyword that reflects achievement, such as “fast,” “finish line” or “personal best.” Curalate can make it easy for marketers to identify these common terms. 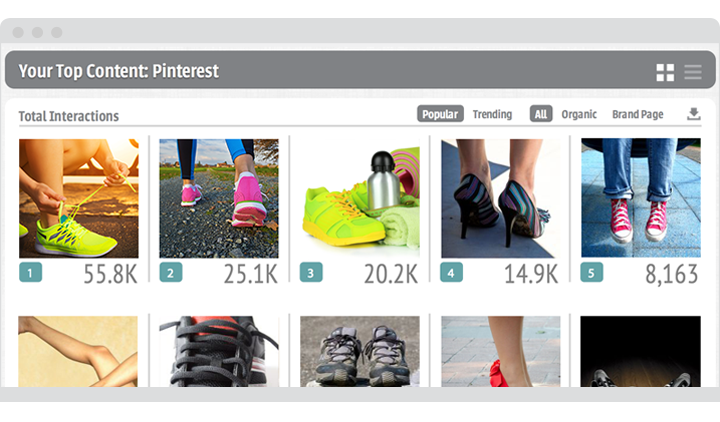 Armed with this insight, marketers can make Pinterest content more relevant to shoppers.